Summer 2018 / 2019 Camps, Booking Now! Contact us to enroll your child or young adult in a 3 day intensive riding school camp! 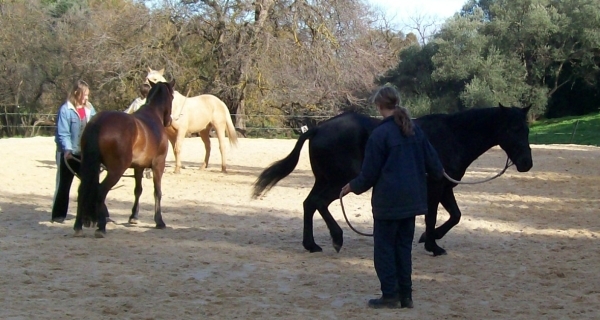 Running Tue - Thu including meals and a sleepover on Tue and Wed nights, your child will enjoy a wide range of activities and lots of hands-on time with the horses. Total cost for the 3 days, including meals and sleep over: $330. A $100 deposit must be paid to secure your spot. Children MUST have riding boots to attend a school camp. They can bring their own riding helmet if they have one, however we do supply helmets if they do not have their own. Please note that we do supply pillows and doonas, however some children may like their own pillow and if the evening becomes very cold then the sleeping bag will give them extra comfort. Camps will run most weeks during each school holiday break. Students can arrive any time from 7am - 8:45am on the first day. Those arriving early can join in with the morning feed run of all the horses on the property, starting at 7:30am. The first session of the daily program starts at 9am. Students can be picked up any time after 5pm on Thursday. Booking form to print, fill out and send back to us. Booking form (MS Word) to fill out and Email back to us.